Crab Stuffed Haddock has been one of our favorites for awhile, but there are a couple problems with it. First, it’s very expensive to make, and second, we really love the “stuffed” part of the meal, and there’s never enough of it. So this is my own version of crab stuffed haddock, which really is not crab stuffed haddock at all – it’s more like “crab-stuffing smothered haddock,” or “crab-stuffing haddock casserole.” There’s enough “stuff” with the fish that we don’t feel like we need to have a whole fillet apiece, so it costs half as much as the actual “stuffed” version. Saute the onion and garlic over medium-high heat in the olive oil. Remove from heat. 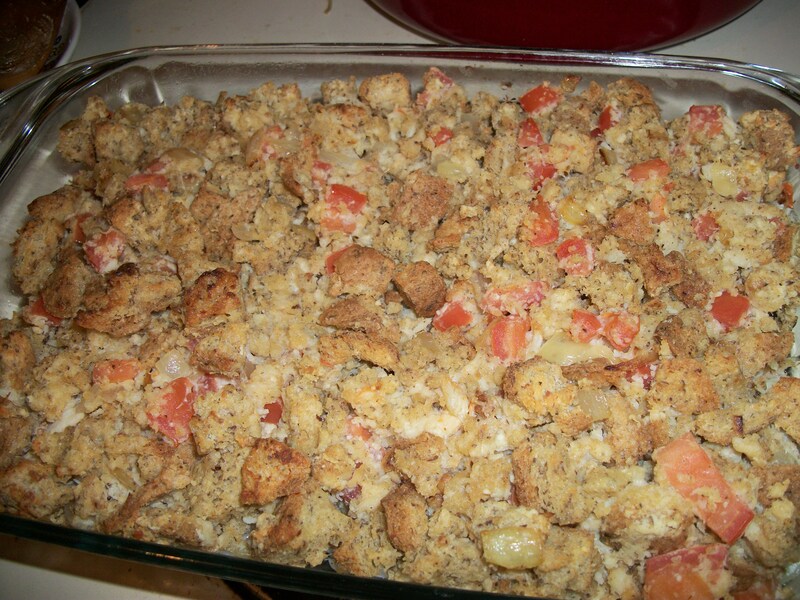 Stir in the bread cubes, tomato, lemon juice, cheese, crab meat, salt and pepper. Pour the beaten eggs over the mixture and thoroughly stir until all the stuffing mixture is moistened. Lay the two haddock fillets out flat in a sprayed 7×11 baking dish (you can probably use another size, but the haddock fillets fit perfectly in this size dish!). Since this recipe makes four servings, cut each fillet in half before spreading on the stuffing; this will make it easier to take out individual servings. Rub some olive oil onto the top of the fillets. 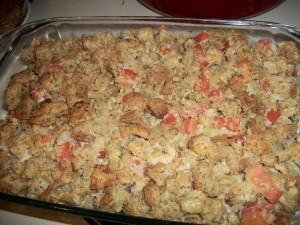 Spread the stuffing mixture over the top. Bake for 20 minutes at 375, then remove the foil and bake for an additional 10 minutes.